"We’re watching what happens with the Switch with great interest"
We were more than a little disappointed when Micro Machines: World Series was announced for PS4, Xbox One and Windows PC but not for Nintendo Switch earlier this year. To be released on 30th June, we feel this is a game much like Rocket League which would be perfectly suited for local multiplayer on the Switch. I love my Switch, and there are clearly aspects of Micro Machines that make it an especially good fit for that platform. But for now, the team is wholly occupied with the PC, PlayStation 4 and Xbox One versions of the game. We’re watching what happens with the Switch with great interest, but there’s nothing more we can say right now I’m afraid. So at least Codemasters hasn't completely ruled out a Switch port, but like so many other publishers it is watching from the sidelines to see if there is a worthwhile opportunity. As the Switch is gaining some serious momentum at present, we have our fingers crossed for a Director's Cut for Switch in the future. 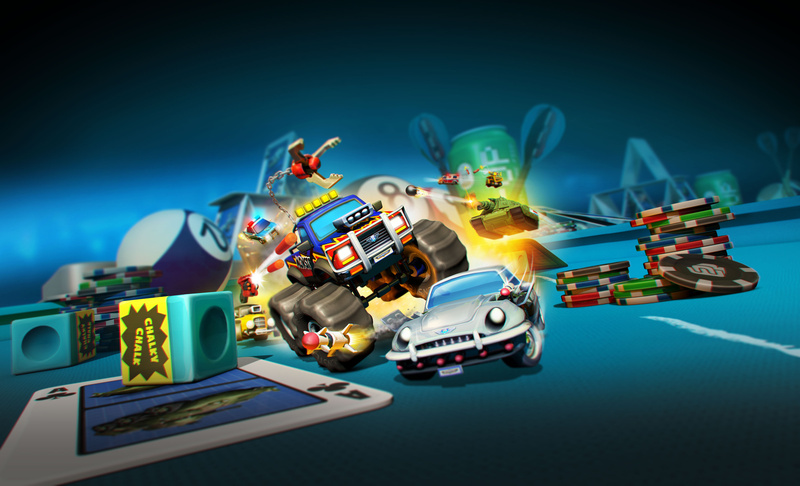 Let us know if you'd like to see Micro Machines: World Series make it over to the Switch with a comment below. Seems to be an ongoing theme. The fact that Rocket League has been officially announced for the Switch, by a much smaller developer, should be giving Codemasters enough reason to bring Micro machines over. Especially as Codemasters are supposed to be on the partnership programme. In fact even games like Snake Pass made it over with little effort. So full of it aren't they? People keep moaning about 3rd party games not coming over. But is it even possible for games like the new cod and battlefront 2 to run on the switch??? Too much watching and not enough action! @JH64 Micro Machines is not CoD or Battlefront. Every one just watching isn't going to make anything happen. Takes me back to 2002 when they announced they were developing for the GameCube, then cancelled all GC games in development a few months later, and the only GC game they ever released was Free Radical Design's "Second Sight" in 2004. It seems there are more devs "watching" then "making" games for the Switch. At this moment these company's are leaving money on the table. With people wanting to play everything on the Switch and the small library its prime to at least get in and get out. Rats, another reason for people to comment about lack of third party support. Doesn't Really Matter for me. @JH64 probably not - but Micro Machines is nowhere near requiring that kind of hardware, it should really be an easy port. I'm surprised to read they are not developing for Switch yet. We'll it's the same story with this third parties...plus not in least interested in micro machines. Well i haven't seen the trailer yet but I really want a arcade racing like need for speed... :/ I guess we'll wait and see. I see very little difference between the "I love the Switch I have one" argument in the case of third parties not bringing their titles over and the "I'm not racist I have black friends" line. I do despair at this type of approach of 'wait & see' there must be valid reasons to support a platform but you only need to look at how the switch is currently flying off the shelves and is massively in demand. surely this couldn't of been that difficult to port if they are releasing it on the other formats? if all companies took this 'wait and see' approach then surely no one would get any Business!!!! It seems like he wants too. Not all studios can afford to develop 4 versions at once. I always thought the Master System version of Micro Machines was the best. Answer: This 'fib' is what game developers say when they have zero intention of publishing their titles on lame Nintendo platforms. Question: What is "We’re watching what happens with the Switch with great interest"? I loved this game for the Amiga back in the day. Almost as much as I loved Super Cars 2! The graphics are interesting in the way they're using a shallow depth of field to get across the 'micro' look of it. Gameplay looks a little soft but it's hard to tell without playing. Really good use of destructible / interactive environments would be great for this game. Hopefully it wouldn't be much of an issue technically. I just think maybe people build stuff for PC / PS4 / Xbox because it's easy to group them - and then think about nintendo consoles afterwards because they're in a different bracket technically. I'd be really surprised if this didn't come to Switch - just when. I wouldn't hold out hope. Remember what happened to F1 Race Stars? It was released as a digital download only and without the online multiplayer. I remember asking Codemasters when the Wii U was released if we'd see their DiRT or Race Driver series on the console and the reply was that they'll assess the situation or something like that. Now I know the Wii U was a failure but they didn't even bother releasing ports of their last games. So in summary, they're a lazy developer and no, we won't see this anytime soon. Not that I'd want this game anyway. Completely fools for not having released it on the Nintendo Switch before anything else. That is their audience. Fools. Well, third parties avoided the WiiU and it didn't seem to hurt any of their bottom lines. On the other hand, supporting a new system with a small install base and a group of owners that rarely buy anything that doesn't have Mario or Zelda is probably not the smartest business model. "We'll be watching the Switch with great interest." Just read an interview with the devs and it seems like the online play is a big thing for this game - teams etc. That might be a complication for bringing it to Switch initially at the moment? Have to say it looks great after watching a few more vids. Seems like a perfect fit for Switch! Come on Codemasters - bring it home! Basically it's WiiU 2.0 and we're not getting Third party support. To Codemasters: Ya'll are stupid. The Switch is already a success. I'm tired of the dumb attitude besides Ubi. As much as people complain about them, I respect their effort and I supported almost all of their Wii U games. Too bad others did not. Seems like developers are waiting for Switch to be such a success that they would be foolish not to port games...which causes Nintendo to make most of it's money on Zelda and Mario and reinforce the stigma that only first party sells with Nintendo. And then every now and then you find an outfit like Yacht Club, Psyonix, Sumo Digital, Wayforward, even THQ Nordic and Ubisoft confident enough in their product to support it on a Nintendo platform. To me, the indies are just a different size or bracket of third party. If Codemasters, Capcom, etc. won't come, I say just support the ones that will. After the Yooka Laylee delays, Capcom just seemingly dropping out and now this I'm over it lol. @JH64 The short answer is "yes." Switch supports modern interfaces, coupled with direct support from nVida. Unreal Engine 4, for example now officially supports it, as a built in target for a project build (build for PS4, build for PS4 Pro, build for X1, build for Switch). Each platform, including Switch DOES take additional effort to tune and scale appropriately for each hardware platform. Tuning for Switch would be like tuning for a more budget gaming PC builds, which these companies mostly do anyway. Any "scalable engine" meaning "engine that can can adapt it's settings, features, draw distances, level of detail, effects, etc. to scale for everything from a low-end PC to a screaming 3-GPU ultra gamer PC) CAN run on Switch. So, yes, most of those games can run, though they won't look as glossy and pretty as they do on the other platforms, if companies actually invest the time and money to actually do it, which they'll only do if they think putting it on Switch will greatly increase their sales for their game. Even if Switch were physically identical in every way to a PS4 Pro, companies would only bother paying Nintendo licensing fees, and doing a whole different SKU production if they thought they'd actually increase their sales by doing so. If they know most Switch owners also own another platform, for example, there's almost no reason for them to port, financially speaking....it means spending more money to get the same customers. In the case of THIS game however, it seems like a game that might click more with the Switch audience than the other platforms...so it's very possible it's the kind of game that it would be justified, it might see higher sales ratios on Nintendo as games like Puyo Puyo Tetris, Snake Pass, and Disgaea 5 have. What ever happened to developers taking a chance? I mean, has micro machines made its budget back on Xbox PS and PC yet? I know I'd by it on Switch, but not on the other platforms for some odd, unknown, personal reason. If interest is there for the game people will by it, same on all platforms right? Switch will get this treatment for the next year or two from big devs, nothing new there. Had it been available next week for switch when it releases on the other platforms I'd have bought it but instead I'm having to buy the ps4 version. I use my switch 99% of the time as a home console so I've zero need to buy it again if they do get round to releasing it. @NEStalgia Good reply - well put. hey look, its another multi-format releaser thats not on the switch. This is pretty worrying. if its selling hugely and is easy to port to, what's the problem? Whilst the system does have a lot of good games its feeling more and more like a wiiu situation all the time. "Eventually, if we really see that there's good money to be made on the system, we'll be there." Well thanks studios, we didn't figure that out ! Haven't played a micro machines for years. Maybe a VC release of eg the N64 version would be a good, easy, cheap start. This is dissapointing. It's not like it's pushing the limits of hardware technology is it. I don't get why a kid friendly game shouldn't be on a kid friendly console, other than they just can't be bothered. @JH64 when cod4 came out, dev said it couldn't run on Wii. When codmw2 came out, Wii got cod4. And many others. So yes, if devs want to make it, then they will. And my Wii U cod games have got plenty of use over the years. We all know the conundrum with Nintendo systems and third parties. It is multi-layered problem that is partially on Nintendo, but partially on the fans/owners of their systems. Here is where I think devs are mis-calculating. First is Switch is selling like fricking mad and with the lineup N is bringing on there own the Switch sales are not going to slow down any time soon . So this aint no WiiU and is expected to surpass WiiU lifetime sales in one year. I expect no slow down next year with the mega titles they have announced. So wait and see is just stupid at this point because by time they wait and see Switch will have 30mil install base and then they have wasted earning opportunities. But here is the even bigger misstep. Switch is selling to a different crowd than WiiU or even past Nintendo systems. Switch appears to be selling to lapsed gamers. Those that have been sitting out recently because no system appeals to them or gives them the flexibility to play with the dense lives. Switch addresses that. Also many PC and other console players see Switch as an option not just to play Nintendo games, but as an alternate formfactor device to play all types of games. So look if these trends are true and continue then by next year's E3 we are going to see an entirely different attitude. I understand the big houses being reluctant because of the cost of their developments and the sales thresholds that must be reached to make it worth their while, but smaller developments like Micro machines should be no brainers. Even though the base will get bigger making success by publishers more likely, they are still missing out on this great window of when a machine is just selling out all over the world and people are hungry for content. Anything well made is going to sell right now on Switch because damn it we WANT GAMES. Look at minecraft, top selling game, and M$ is giving it full support with their new online expansion. Tell me they aren't making money on it big time when it has been at the top of eShop sales since the day it released. Oh good, more people surprised that third-party support is slow coming to the machine that succeeds the Wii U. @JH64 CoD yes. Battlefront II no. Not because the Switch is underpowered but because Frostbite is a messy and difficult engine. Frostbite, to me, is a classic example of a poorly optimized engine that just needs more and more power to make up for that poor optimization. Having more power is an easy way out for devs not wanting to deal with headaches like how flexible an engine is. Don't you ever wonder how Nintendo games manage to look good on weaker systems and also take up less space? Nintendo's teams are simply less lazy. @readyletsgo "What ever happened to developers taking a chance" HD happened. Budgets skyrocketed along with payroll and turnaround times for developing even a small game. Nobody can afford to take a bath at the cost of failure on an HD platfrom, and only safe bets are taken both in design concept and target platform. People got the shiny and pretty they asked for at the cost of risk and innovation. @QuickSilver88 Really good point about the Switch selling to different types of gamers. I'm an example of that - not owned a console in years - last was Gamecube - and Amiga before that. But I love video games - especially Nintendo games. Switch is SO tempting for me but I have a young family. I have bought us all a Wii U as it's more robust and there are some brilliant multiplayer games suited to younger kids - but I'll be moving them onto the Switch as soon as is reasonable. Might have to buy one for myself and just hide it! Zelda BOTW, Mario Kart D, Arms, Splatoon 2, Mario + Rabbids, Mario O, Xenoblade, Metroid 4, Pikmin 4, Smash Bros, Pokemon ?, Animal Crossing . . . and the rest - Plus a ton of sweet indie games. You're right about this being a good moment to get good games out for it - there is some serious completion coming. In regards to the 1st half of your statement I think companies are over looking an untapped market. I'm in my mid 30s and grew up playing lots of games. As I have gotten older I play less and less because of work, kids, wife and so on. Do I own another platform? Yes I do but, it has been almost a year since I bought a game for it since I know I will have no time. I instantly bought a Switch because I can find time to play it. I WILL buy a game for the Switch that I won't buy for my ps4 because I can find 10 mins to play. I honestly think there are tons of people just like me that are being over looked in this scenario and are a potential gold mind. "We want to see what happens with this gaming system but we won't put games on it until other third parties that don't put games on Nintendo systems put their games on Switch first. Then when we are late to the party and don't sell well we will blame Nintendo and consumers instead of doing like we do with the rest of consoles and just put our games on it to build an audience." If the system has games people will buy it, if more people buy the system there are more potential customers for your games...this is not hard. People buy Nintendo games for two reasons...they are good (which every dev should strive to be anyway so that's a given) and they are actually on the system! "Should I buy Zelda or COD...oh wait no COD guess I'll get Zelda today!" @Rafx Absolutely, I fit that same mold....I do still buy some PS4 exclusives (and a handful of AAA games) but end up never playing them. Switch fits life. I think where these companies are hesitant is, that's an entirely new market. It's not the usual Nintendo market, and they're not sure if they want to take that risk on it before just letting some of the big hitters spend on it first (Bethesda, Ubi, etc.) and see how it goes. They're not sure yet if momentum will continue, and how may people there are that would rather play an "inferior" (looking) version of a game on a more convenient to use console. I.E. how much of their own demographic cares, and how much of a new demographic cares about the kind of games they make, etc? They're going to wait for others to take the risk to find out. If you look around even this forum and you see all the "I only play at home anyway, I don't care about portability, I want voice chat with my 20 friends, and I don't want to play with them in person. I don't even want the option." That's been the core audience for ALL of these companies for many years. It's a little understandable they're unsure of the profit potential for "actual adults with lives who want to play games that aren't at their most photorealistic on a console of convenience." I totally missed that there was gonna be a new Micro Machines, looooved them games back in the day. Now i really hope for a Switch version. @NinjaBadger as much as some NDFers hate that it's a thing, until Nintendo makes a console literally in parity with the other two, they will continue to have these issues. Do you want to be able to take your system on the go and plug it into the TV? Or do you want all the games the other guys have and playing them in the traditional style of the other guys? Perhaps a few generations from now, the Switch template of console will be the norm (as technology catches up) but until then, the PS/XB model rules the roost. @NEStalgia the day Sony and MS make their own hybrid consoles is the day it becomes mainstream and globally accepted by the industry and developers. Thems the breaks when you're the big dogs (PS/XB) as well as when you're just trying to get in where you fit in (Nintendo). Right now is the perfect opportunity for publishers to get a big game o the Switch - the Switch lineup has room to accommodate and you would be guaranteed exposure on the shelves while the console is still selling out. I suspect Skyrim will do better than some anticipate due to its timing. What they waiting for, even with PS4 millions of sales this games will not sell millions in return it's doesn't work like that, so what are they waiting for? See if the game of such an old concept sells??? Dev1 : Lets wait and see if 'Dev2' releases games for it and then it becomes popular and then we can also release games for it. Dev2: Lets wait and see if 'Dev1' releases games for it and then it becomes popular and then we can also release games for it. Public : I hope Devs release games for it and make it popular. @gatorboi352 From a marketing standpoint, you're right. From a reality standpoint, the idea that there's a 4th console that can run the same games at a lower spec that trades peak graphics performance for mobility shouldn't be a difficult concept for the industry to understand a decade after the iPad. Consumers seem to be much quicker on the uptake this time than the industry itself, revealing just how myopic and disconnected from consumers the "industry" has become. One thing is clear among competitors. Sony doesn't get it. Not surprising. Sony hasn't understood mobile since the end of the Walkman audio cassette era. Microsoft gets it. They're knee-deep in mobility themselves, driving it, outside XBox, as the core of their company. It's clear they understand Switch very well. The 3rd party publishers have just been out to lunch, being very stuck in their existing paradigms. The idea doesn't need to become "mainstream". If you're a 3rd party, it's just a "low spec console" to target. Nothing special to do internally. There's no real technical resistance to it. The resistance appears to be all from the business angle being unsure of the market reach. "Do you want to be able to take your system on the go and plug it into the TV? Or do you want all the games the other guys have and playing them in the traditional style of the other guys?" That's the funny part. That's a question for Nintendo to present to present the case for buying a Switch. That's not a question ANY publisher needs to grapple with. They just need to accommodate the build target, and identify if their market intersects with Switch's market or not. Too many of them seem to be asking "should people want a Switch" rather than "Do people with Switch want my game?" "Nintendo makes a console literally in parity with the other two, they will continue to have these issues." They will have the same issues even if they have a console "literally in parity." It's all down to business, image, budget, and market research, and has such little to do with technical specification. This cycle is Nintendo's fate until the end of time, forged at the start of the N64, and sealed at the end of the GCN. @NEStalgia well said. The other side of all of this is Nintendo's typically mediocre (to poor) relations with many 3rd parties. Despite their sometimes amazing ideas and products (and software) they need to get out of their own way in regards to their company proper and the draconian ways of doing business. Give me an F1 game on Switch! I still play F1 2011 on my 3DS!! That's a great family game do it!!! What exactly are they waiting for? Switch is selling like hot cakes. Don't they see the mutualistic symbiosis between software and hardware, with more of the former leading to more of the latter and so on? Here's hoping they choose to port to Switch rather than sit on the increasingly crowded fence. "(Switch) definitely performed amazingly well"
"We're getting asked that (about PES on Switch) quite a lot"
What are they waiting for then? I reckon the Fox engine would scale well. I hope some of the worthwhile 3rd party games sell well, so that those sitting on the sidelines are incentivized to move forward with their own games. They would seem tailor-made for each other imo. @NintySnesMan Yup, can't really argue with that. And the library will be amazing I'm sure. But it's a little frustrating for me to see games like Micro Machines and PES slip through Nintendo's fingers at this time. Ho hum. It'll be nice when a few publishers grow a pair and take the gamble though. Too much watching not enough doing. If the Switch is a success without them, by the time they get around to making games they'll find the audience doesn't want their games, because they weren't there to build an audience for their games on the Switch. If the Switch is a huge success, third parties certainly can't really blame Nintendo if their software doesn't sell so well. Waiting until it's already success is not supporting a system, it's leeching. Funny how all of these developers "love" the Switch, and they're all "watching" to see "what's going to happen" with it. Yet none of them seem to realize that if none of them take initiative and develop for it in the early part of the system's life and play a role in compelling/sustaining its momentum, then what's going to happen is "nothing". The system will either stall out, or you'll wait until the system's already dead to bring your game to it and then complain when it doesn't sell, or the system will do really well without your game on it and you'll have lost out on the opportunity. Either way, zero effort nets you zero gain. If this is released on Switch, I will buys in a heartbeat. @Bunkerneath The N64 version allowed you to play with 8 players simultaneously. You shared a controller with your teammate, which sounds odd, but it worked fine. Just so much screaming! To this day, my favorite gaming experience ever. I would buy this immediately. If Switch reaches 10m this year. They will be on it and basically every other developer. No need for micro machine with mk8 being such a great game. Switch need to turn around the lack off third party support to be a true success. Hopefully if switch sales numbers stay strong, in 12months time third parties will be jumping on board. @FTL Oh, I know. And it's not that I don't understand it. It's just that I'd prefer they say nothing at all over constantly patronizing people about it. Wait, is it April 1st? Oh, wait it's not. Now I'm confused. Every single one of these companies "watching" the Switch--the ones that have a particular game already releasing on the other platforms but not coming to Switch right now--is basically missing the point in my opinion: If you end up releasing that game on Switch a year down the line or whatever then you create pretty much every possible issue that fans can raise, bit it getting the game late, or it being outdated and old, or everyone already owning it, or it feeling like just another port rather than being a new release like it would have been if it were release at the same time as the others, or feeling like Switch is a second class system, etc. They're all playing it safe unwilling to take a.gamble and this goes for Capcom as well since they chose to port a 20 something year old fighter that's also ridiculously overpriced. This seems like a natural fit.lets hope rocket league sells well. I would buy this day one if they just crack on with it! People are just gonna have to be patient. Switch isn't Wii U 2.0 as it's selling but support was always going to be slow coming. Third-party games have struggled on Nintendo for years and there's also the Wii U legacy to deal with. Switch won't get the same support as PS4 or XB1 but support will come. Out of their mind much? We had Micro Machines on NES, Game Boy, SNES, and N64! I've seen some gameplay and when MK on the Switch is 10 than this game is 3 or 4. Looks very boring. I think that the Switch will be fine with MK and Rocket League.